Between its fantastic rivers and shimmering lakes, Tennessee has plenty of great opportunities to get out on the water and soak up the sun. The state offers plenty of fishing opportunities, as well as places to enjoy your favorite watersports or simply cruise around seeing the sites that just aren’t possible on foot. Book your next boat at one of these 10 best boat rentals in Tennessee and set your sights on adventure. Pontoon boats, fishing boats, even houseboats are available for rent at this marina. Their fleet is well maintained and folks love the flawless rental experience. Situated on Center Hill Lake, there are tons of waterfalls and unspoiled shoreline for you to explore. Located on Watauga Lake, you’ll be surrounded by breathtaking views every moment you’re on the water. Their fleet includes both ski and pontoon boats so you can have your fun any way you like it. They also offer fishing licenses for on-site purchase so nothing can stand between you and your day on the water. Pontoon boat rentals here get you out on the water for a day of touring, fishing, and total relaxation. You can rent for a half or whole day, but either way prices are extremely reasonable. When you’re done cruising for the day or just need a break, the marina has an on-site restaurant with waterfront views that can quell your rumbling appetite. This place is your full outfitter for a day on the water. Choose your watercraft, whether it be a pontoon or deck boat, single or double decker, fishing boat or open bow, add a standup paddleboard or kayak, then set off for adventure. The marina is on Chickamauga Lake, a popular fishing destination and perfect for watersports. As the largest WaveRunner rental agency in Tennessee, these guys don’t disappoint. Fuel your need for adventure with a WaveRunner or jet boat and all the toys you need for fun: wakeboards, tubes, skis, ropes, and kneeboards. They deliver to thirteen area lakes so you can pick your playground that suits you best. There’s no better way to experience the Smoky Mountains than with a boat rental on gorgeous Douglas Lake. The marina here is part of a full service resort, but even if you’re not staying on site you can rent a pontoon boat with a minimum of two hours. All rental prices include gas, taxes, and free ice cream, which is reason enough to rent your craft here. Nestled on scenic Center Hill Lake, this marina is known for top notch boat rentals and the best catfish in the area. Their boat rentals were designed for all-day leisure, so you can take in the views and enjoy your time on the water. Stop by their fully loaded shop for water toys and apparel before you hit the lake. From boats to paddleboards to jet skis, you can have it all. Rentals are quick and easy, and give you flexible rates and times to get the most from your experience. They also have a full stock of towables, like tubes and wakeboards. It’s a true mountain retreat that you’d be surprised existed so close to the busyness of Pigeon Forge and Sevierville. They just introduced a brand new fleet of pontoon boats to give you a high-quality boating experience that’s fit for any budget. Fans rave about the cleanliness of the vessels and prompt service from the staff, which really adds to the overall experience. You can play all day for one low fee, a huge bonus for those who just can’t get enough lake time. Located on Dale Hollow Lake, this small marina and resort offers small boat and kayak rentals. Perfect for a family or a small group, their fleet includes deck boats, pontoons, double decker pontoon boats, and jon boats, all of which are available for full day rentals. 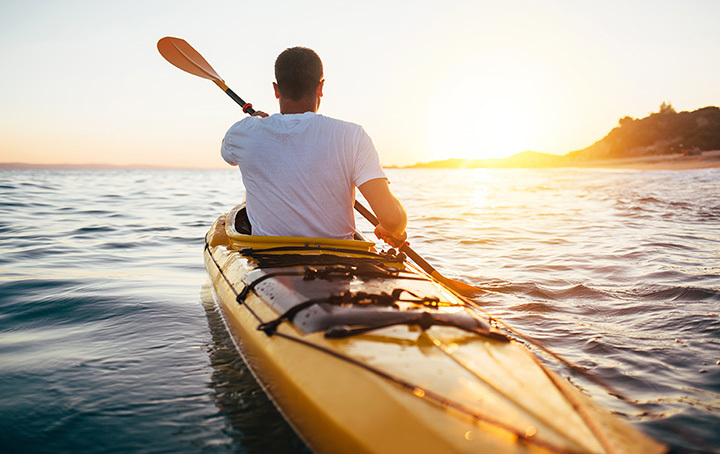 For a quieter, cozier experience, you can rent a kayak by the hour and go where even small boats can’t travel.